Update: Thank you for the support! We are humbled and grateful for the dedication of the performers, the volunteers, and the staff of the Royal BC Museum in making this project such a success. All four performances as well as the invitation-only preview of Music for Natural History were sold out. Stay tuned for updates about the Music for Natural History film and CD. Part tragic love song for the wilderness, part experimental sound art, Music for Natural History is a live performance that gives voice to the taxidermied birds and mammals, human-made trees and painted landscapes that form the exhibitions in the Natural History Gallery of the Royal BC Museum in Victoria. Through careful cataloging, research and transcription, sound artists Tina Pearson and Paul Walde have created scores from sounds of the flora and fauna represented in the Gallery’s dioramas. Supported by the Canada Council for the Arts, and produced by LaSaM Music, the result will be performed at the Museum January 15 and 16, 2016. The event features local musicians and community members who have participated in listening and sound making workshops designed to connect with the biosphere from the inside out. 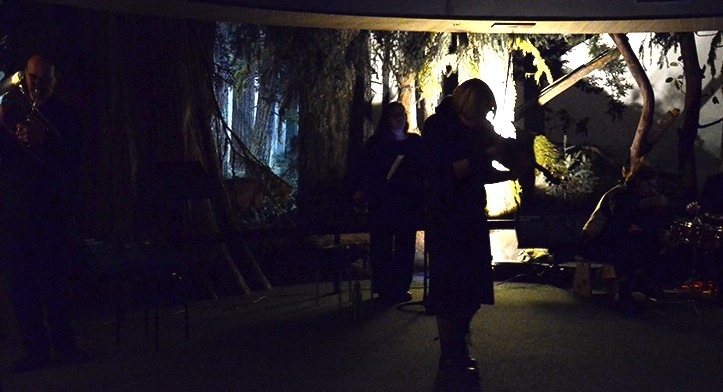 They also have worked with the composers to use instruments, objects and voices in unusual ways to produce a living soundscape representing the dioramas. The project included two public lead up events: Click MusicForNaturalHistoryOCT-2015-MR for a Media Release or continue reading below. An introduction to the Music for Natural History project, including a sound walk through the Natural History Gallery and in Beacon Hill Park. An opportunity to listen to the complexities and richness of the soundscape and reflect on its changes in the time before the Museum was in place to now. Please wear comfortable seasonally-appropriate clothing and footwear. A revelation of themes behind the Music for Natural History Project, including a discussion about acoustic ecology and a participatory workshop using sound play to become more intimately aware of surroundings and environments. This workshop exposes participants to the dilemma of sound/acoustic ecology, and to the waning wilderness soundscapes of the Pacific Northwest. Live performance featuring Victoria artists including Joanna Hood (viola), Julio Lopezhiler (violin), Rachael Wadham (violin, accordion, percussion), Ajtony Csaba (cello), John G. Boehme and Alisa Gordaneer (voice), George Tzanetakis and Nathan Friedman (clarinets, recorders), Arlene Carson (accordion, ocarina, percussion), Geraldine Bulosan and Janet Sit (recorders, voice, percussion), Chris Tooley (voice, whistles, flutes), Tancha Dirickson and Claire le Nobel (percussion), Paul Walde (recorders, percussion), and Tina Pearson (flutes, voice). With the Museum’s pre-recorded audio silenced for the evening, audiences will take an alternate sound-focused journey through the exhibition spaces. Beginning with an audio prelude in the pre-history of the darkened Woolly Mammoth’s ice cave, their path will take them to a sonically animated dawn within the Forest Exhibition. It might seem, at first, that they are hearing a field recording. However, they will actually be in the midst of a live acoustic interpretation of the sounds of the flora and fauna represented in the Forest exhibition. Sixteen vocalists, sound artists and music instrumentalists, who have spent weeks learning to replicate the sounds of wind, birds, mammals and rain, will present the sonic story of an imagined day through a dry coastal forest and continuing to a rainforest stream as they reveal, in performed sound, detailed interactions of the displayed life forms. Once the audience arrives in the Seashore exhibition, the performers will bring to life the dynamic sounds of ocean surf and the alternately cacophonic, dramatic and serene voices of Pacific coast sea lions, cormorants and other mammals and shoreline creatures. Finally, the audience will be led through the Delta estuary display accompanied by an audio collage of bird song blended with increasing layers of human soundscape. Music for Natural History blurs boundaries between sonic mimicry, soundscape composition, classical music, and dada-ist sound poetry within the already paradoxical setting of the Museum’s exhibitions. In its aural animation of these surrogates for the natural world, it is at times corporeal, tragic, poignant, alluring, and even humorous. At its heart, however, this sonic artwork reminds us that nearby environments that were once teeming with the complex array of sounds made by millions of creatures sensing and interacting with each other, with plants and trees and with the shifting sonic patterns of wind, rain, snow and heat, are rapidly being silenced by loss of habitat and species as they become overwhelmed by human-made sound. Recognizing that human ancestral responses are deeply woven into a sophisticated sonic engagement with such dynamic soundscapes, Music for Natural History might also be interpreted as a longing for remembering what we no longer hear, and what we no longer sing.